Would you care to see the power of social media? Go ahead and check out the Facebook Page for Yellow Tail Wine. If that doesn’t impress you, do a search for Yellow Tail on Twitter. A recent donation of $100k to the Humane Society of the United States has fans in a serious uproar. The recent donation has turned into a public relations mess that will be no easy fix with the masses speaking their mind through social media, sharing their story with thousands of people per tweet. Why are these people upset? Many people don’t realize what the Humane Society is all about. Let’s see what is HSUS against..? Hunting, fishing and livestock production…HSUS is not the fuzzy puppy in the animal shelter group that people picture them as. Only $450,000 of the $89 million they raised last year went to animal shelters. The rest went to fundraising, lobbying and salaries. This “non-profit” group gets people like you and I to donate money during times of crisis like Hurricane Katrina to provide food and shelter for displaced pets. Many have fallen to the lure of HSUS. How powerful is social media? 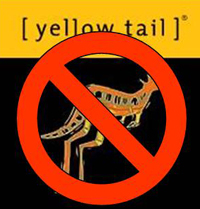 Yellow Tail will soon figure that out by how by the costs of repairing a well-known brand and image. This entry was posted in Education and tagged Facebook, HSUS, Humane Society of the United States, social media, Twitter, wine, Yellow Tail.